Whether you plan to serve four or 2,000 residents, cluster box units (CBU) provide a flexible solution to accommodate your building project needs. Simply select the pre-configured unit(s) that has the best options for your residents. 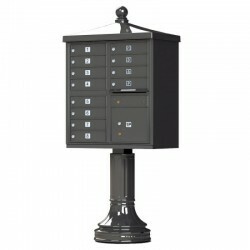 These standard stock units can be used individually or in larger group installations - all providing a convenient, secure method of mail and package delivery to residents. 12 Tenant Door Classic Decorative CBU Mailboxes - Type 2 - 1570-12AF-DCDecorative CBU Mailboxes – Cl..
12 Tenant Door Traditional Decorative Style Mailboxes - Type 2 - 1570-12AF-DTPrice includes pedestal..
13 Tenant Door Classic Decorative CBU Mailboxes - Type 4 - 1570-13AF-DCDecorative CBU Mailboxes – Cl..
13 Tenant Door Traditional Decorative Style Mailboxes - Type 4 - 1570-13AF-DTPrice includes pedestal..
16 Tenant Door Classic Decorative CBU Mailboxes - Type 3 - 1570-16AF-DCDecorative CBU Mailboxes – Cl..
16 Tenant Door Traditional Decorative Style Mailboxes - Type 3 - 1570-16AF-DTPrice includes pedestal..
4 Large Tenant Door Decorative Classic CBU Mailboxes - Type 5 - 1570-4T5AF-DCDecorative CBU Mailboxe..
8 Tenant Door Classic Decorative CBU Mailboxes - Type 1 - 1570-8AF-DCDecorative CBU Mailboxes – Clas..
8 Tenant Door Classic Decorative CBU Mailboxes - Type 6 - 1570-8T6AF-DCDecorative CBU Mailboxes – Cl..
8 Tenant Door Traditional Decorative Style Mailboxes - Type 6 - 1570-8T6AF-DTPrice includes pedestal..
4 Large Tenant Door Traditional Decorative Style Mailboxes - Type 5 - 1570-4T5AF-DTPrice includes pe..
8 Tenant Door Traditional Decorative Style Mailboxes - Type 1 - 1570-8AF-DTPrice includes pedestalAl..